Compared to purchasing new, refurbishment can be a cost effective option. By bringing the component to a serviceable standard and re-establishing the correct clearance between screw flight tip and barrel wall, the refurbished screw will provide processing and production levels similar to the standard of a new component. Screws can normally be refurbished to standard diameter through local weld repair or surface treatment and rebuilding of the flight profile. Before any refurbishment is undertaken, a thorough inspection is made of the screw to determine the extent of wear, corrosion or other damage. We then establish the scope of work necessary to bring the screw to serviceable standard. If there is excessive wear or corrosion on the root diameter or flight, it may not be possible to make a repair. 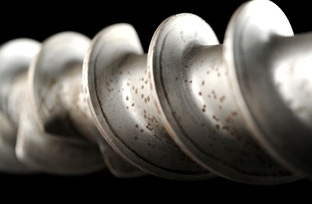 It is therefore important to monitor the wear rate of the screw and barrel to ensure both long term processing efficiency and that replacement or refurbishment is planned with minimum disruption to your production. MAGOG offer a condition monitoring service to help identify any potential issues and predictive planning for replacement or refurbishment. 1. The first stage involves preparation grinding the screw to achieve a uniform outside diameter across the flights. 2. Flights are then re-built using a special grade High Speed Toolsteel (doesn’t craze or de- laminate like some other grades) that is applied by means of a TIG welding process. The welding process is semi-automatic, this being to apply the weld in a steady and uniform manner. In some cases (for example, if the screw is through hardened) the screw may be pre-heated, this being to give a superior cohesion between the base metal and the hard-facing being applied. 3. When the hard-facing of the screw is completed, there is a minimum of +1.5mm over finished diameter of material on the flights. The screw is cooled at a controlled rate in order to minimise internal stresses. Final grinding of the flights ensures the correct diameter and parallelism of the finished part. Where screws are refurbished in conjunction with the refurbishment of barrel, and the barrel bore is honed to parallel and concentric, the screw diameter will be finished to achieve the original design standard clearances. Magog Industries are the UK’s leading manufacturer and refurbisher of screws and barrels for the Plastics & Rubber Industries. 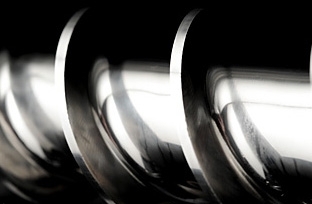 To acquire comparative quotes from all the leading UK screw & barrel manufacturers visit here.